The BricsCAD license modification always requires an Internet connection. Upgrade a license (e.g. from Single Classic to Single Platinum). The old key is no longer valid then. Replace a license (e.g. a Single Classic by a Network Pro). The old key is deactivated automatically and is available to be activated on another computer. 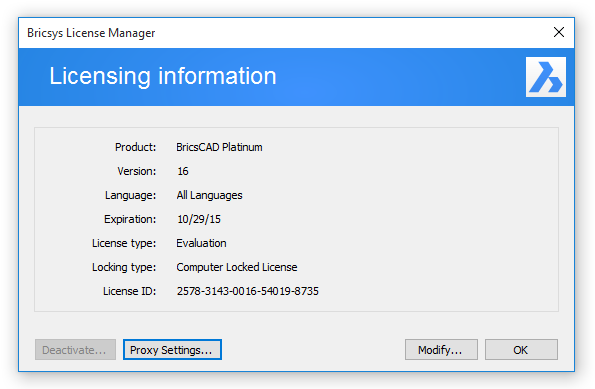 In the Help menu, choose BricsCAD License... . The Licensing information dialog opens. Click the Modify... button to activate another Single or Volume license, or to use another a Network license.